The researchers have shown that the therapy produced no serious side effects in patients with the disease, also known as amyotrophic lateral sclerosis (ALS). The phase 1 trial’s results, available online in Lancet Neurology, also demonstrate that the drug was successfully introduced into the central nervous system. The treatment uses a technique that shuts off the mutated gene that causes the disease. This approach had never been tested against a condition that damages nerve cells in the brain and spinal cord. ALS destroys nerves that control muscles, gradually leading to paralysis and death. For treatment of the disease, the sole FDA-approved medication, Riluzole, has only a marginal effect. Most cases of ALS are sporadic, but about 10 percent are linked to inherited mutations. Scientists have identified changes in 10 genes that can cause ALS and are still looking for others. The study focused on a form of ALS caused by mutations in a gene called SOD1, which account for 2 percent of all ALS cases. Researchers have found more than 100 mutations in the SOD1 gene that cause ALS. “At the molecular level, these mutations affect the properties of the SOD1 protein in a variety of ways, but they all lead to ALS,” says Miller, who is director of the Christopher Wells Hobler Lab for ALS Research at the Hope Center for Neurological Disorders at Washington University. 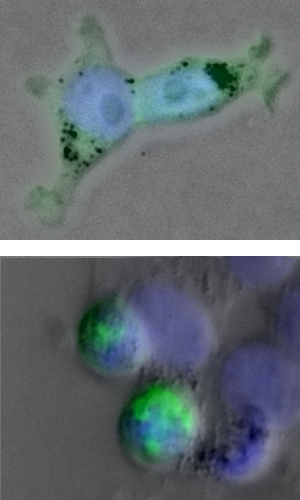 A mutated protein that causes an inherited form of Lou Gehrig’s disease leads to clumps in the human cells in the bottom image. A therapy that blocks production of this protein has passed phase 1 safety trials. Rather than try to understand how each mutation causes ALS, Miller and his colleagues focused on blocking production of the SOD1 protein using a technique called antisense therapy. To make a protein, cells have to copy the protein-building instructions from the gene. Antisense therapy blocks the cell from using these copies, allowing researchers to selectively silence individual genes. Miller and colleagues at the University of California-San Diego devised an antisense drug for SOD1 and successfully tested it in an animal model of the disease. Merit Cudkowicz, MD, chief of neurology at Massachusetts General Hospital, was co-PI of the phase I clinical safety trial described in the new paper. Clinicians at Barnes-Jewish Hospital, Massachusetts General Hospital, Johns Hopkins Hospital and the Methodist Neurological Institute in Houston gave antisense therapy or a placebo to 21 patients with SOD1-related ALS. Treatment consisted of spinal infusions that lasted 11 hours. The scientists found no significant difference between side effects in the control and treatment groups. Headache and back pain, both of which are often associated with spinal infusion, were among the most common side effects. Immediately after the injections, the researchers took spinal fluid samples. This let them confirm the antisense drug was circulating in the spinal fluid of patients who received the treatment. To treat SOD1-related ALS in the upcoming phase II trial, researchers will need to increase the dosage of the antisense drug. As the dose rises, they will watch to ensure that the therapy does not cause harmful inflammation or other side effects as it lowers SOD1 protein levels. The therapy may one day be helpful in the more common, noninherited forms of ALS, some of which may be linked to problems with the SOD1 protein. “Before we can consider using this same therapy for sporadic ALS, we need more evidence that SOD1 is a major contributor to these forms of the disorder,” Miller says. The trial was conducted with support from ISIS Pharmaceuticals, which co-owns a patent on the SOD1 antisense drug. Miller TM, Pestronk A, David W, Rothstein J, Simpson E, Appel SH, Andres PL, Mahoney K, Allred P, Alexander K, Ostrow LW, Schoenfeld D, Macklin EA, Norris DA, Manousakis G, Crisp M, Smith R, Bennett CF, Bishop KM, Cudkowicz ME. An antisense oligonucleotide against SOD1 delivered intrathecally for patients with SOD1 familial amyotrophic lateral sclerosis: a phase 1, randomised first-in-man study. Lancet Neurology, online May 29, 2013. The clinical trial was funded by the Muscular Dystrophy Association, the ALS Association and Isis Pharmaceuticals.